If you think eCanopy.com is just about canopies, think again. Our selection of tarps for sale is second to none, and our commitment to quality is just as evident in our poly tarps as it is in our canopies. Tarps come in all shapes and sizes for all sorts of applications. We carry poly and canvas tarps, boat covers, car and truck covers, tarps from the lightweight to the very heavy-duty, large tarps, small tarps, and everything in between. Not sure what tarp to purchase? Check out our Tarps Buyer's Guide below written by one of our tarp specialists. What are the largest tarps to cover a lawn? I want to kill everything that's growing and start over. We have tarps from 4' x 4' feet to 170' x 170' feet, found here. Do you carry tarps that are 7' x 15', low valance, white, with wrap around velcro? I apologize, but we currently do not sell tarps with velcro straps. Do you have camouflage colored tarps? We currently do not offer camo tarps. I currently have a tarp that is approximately 10' X 10' and has a rope embedded in sides. When you tighten the rope, the tarp tightens up to become a partially opened bag. I use it to relocate leaves and other yard waste on my property. Do you have such a product? We do offer tarps with grommets spaced every 18 inches all the way around the tarp. You may be able to feed a rope through the grommets and achieve the same thing. But, to answer your question, no. We do not offer tarps that have ropes embedded into all sides. I'm restoring a boat and want something to cover it as I work on it. I just want something that can handle Florida sun and rain. The big box stores tarps last maybe 2 months. What would last longer? We would recommend any of our Heavy Duty Tarps. Which materal will last the longest for year round protection on a car port? I would recommend our Heavy Duty tarps. We even have some Super Heavy Duty options in various sizes. I would like to cover and protect my outdoor ping pong table in an unfolded position. What kind of tarp would you recommend? Based on the average dimensions of a ping pong table, and taking into account the need for a water-proof and rot-proof tarp, I would suggest the PTM Tarps Heavy Duty Silver Polyethylene Tarp - 10' x 14' - TS1014. I want to cover a pile of topsoil to keep it from washing away. It will be in full sun most of the day. I'd like it to be brown or green. Can you make a recommendation? Any of our Heavy Duty Tarps should fulfill your needs. 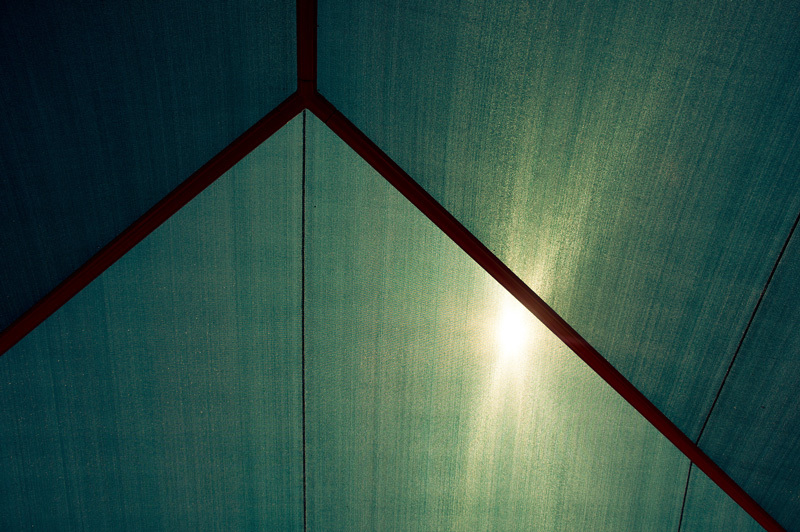 When you think about tarps, you might not realize there is more than just one type. Understanding the number of different materials and models can be overwhelming. So how do you know which is the correct type of tarp for you? What are the differences between the materials? What different purposes can they be used for? These are just a few of the questions we'll be answering in this guide. If you're unfamiliar with what a tarp actually is, a tarp is a large piece of protective fabric that is usually strong, flexible, water-resistant or waterproof, and treated to be appropriate for a variety of uses. 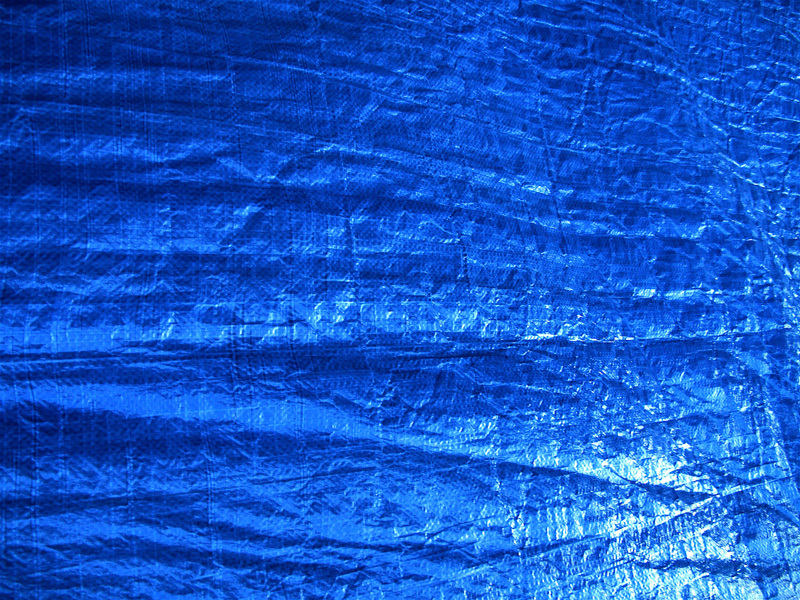 There are many different manufacturers of tarps, some more well-known than others. Popular brands include Everbit, HDX, PTM Tarps, and Polytuf. With any of these brands, you can find a high-quality tarp that will protect your property. 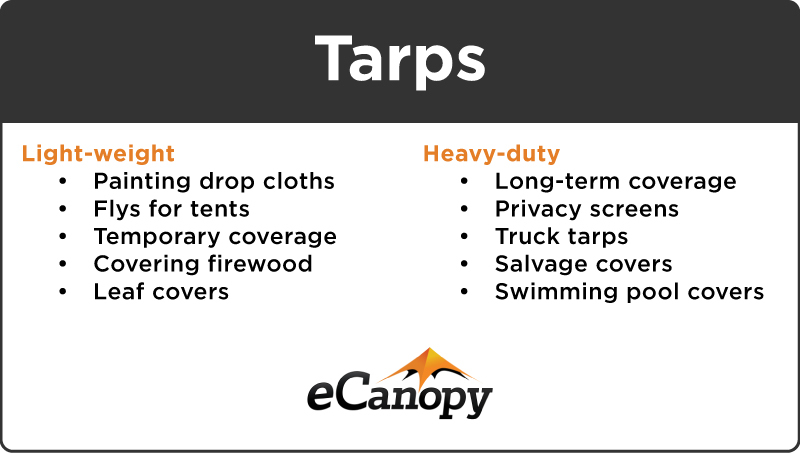 Many people find they are unaware of the difference in weights of tarps. Some think there is just a standardized thickness, when in reality, there is a broad range of tarp weights. Thicknesses range from lightweight tarps to heavy duty specialty models, all with different applications and lifespans. The thickness of tarps is measured in mils, or 1/1000th of an inch. On many tarps, the mil number will indicate how durable it is since the larger that number, the stronger the tarp. However, not all manufacturers use mils, instead labeling their tarps to be light-weight, regular-duty, or heavy-duty. Light-weight tarps might make you think of disposable, thin pieces of plastic but that is no longer the case. Coming in a variety of material, light-weight tarps come in both mesh and solid versions to meet a variety of needs. Often regular-duty tarps are categorized as being part of the light-weight subcategory. Some of the more common uses for light-weight tarps are drop cloths when painting, makeshift tents, temporary shade in the backyard, temporary machinery or equipment coverage, and covering firewood to protect it from the elements. Heavy-duty tarps have a variety of uses and are built to last. Whether you are using your tarp for yard work or protecting your property from water, you can rely on tarps given this label. Heavy-duty tarps only come in solid forms, dissimilar to their lighter counterparts. But some clear heavy-duty tarps can mimic the appearance of mesh. Frequent uses for heavy-duty tarps include, but are not limited to, long-term protection for machinery or equipment, a variety of landscaping and construction uses, privacy screens, and swimming pool covers. Using the appropriate weight tarp is essential. Heavy-duty tarps are predictably heavier than their light-weight equivalent. There is also a contrast in expense; more massive tarps are more expensive. Carefully consider both of these, as well as the purpose your tent will fulfill, before purchasing a tarp. When looking at tarps, you might see there are several different materials they can be made from. The most prevalent three are canvas, vinyl, and poly. Poly can actually refer to either polyethylene or polypropylene. 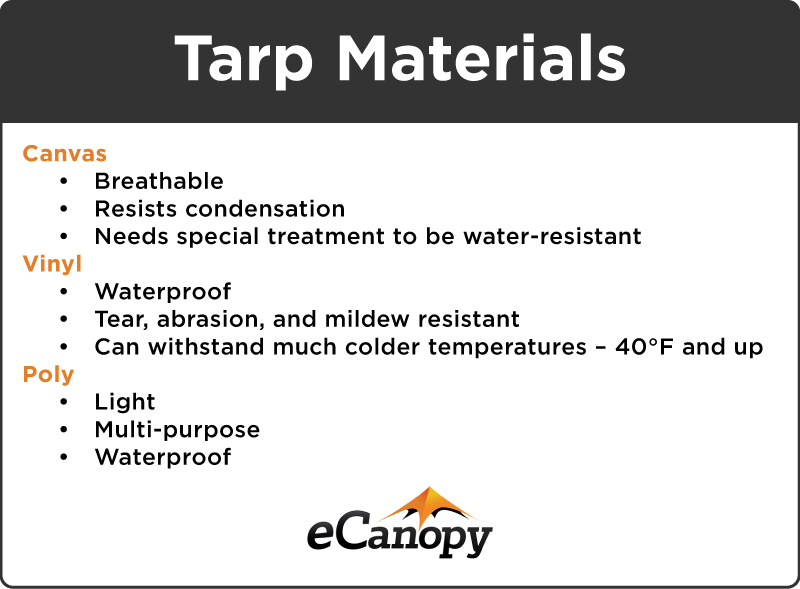 Each material offers benefits depending on the purpose your tarp will have. Additionally, there are mesh tarps that fulfill their own use. Canvas tarps have a variety of uses. Some of their more standard purposes include covers for supplies, tools, construction, and salvage. Thanks to canvas' breathable nature, these tarps can also be used as weather covers for anything that would be negatively affected by condensation. One thing to keep in mind though is that canvas is not waterproof and requires special treatment to be considered water-resistant. Some consumers prefer vinyl for their tarps. That preference may result from vinyl tarps being considered the most reliable and most durable. They are waterproof as well as tear, abrasion, and mildew resistant. Those who need a tarp that will last in extreme cold should consider vinyl as their fabric of choice. Vinyl tarps can withstand temperatures down to negative forty degrees Fahrenheit. But, for all these benefits, there is a cost - literally. Vinyl tarps are more expensive than any other type of fabric. The term poly tarps can be confusing. "Poly" can refer to either polyethylene or polypropylene. Both are standard materials for tarps. In fact, some manufacturers do not differentiate between the two. That is due to the materials being very similar to each other. When you get a poly tarp of either, you can expect it to be light, waterproof, and the least expensive option. Poly tarps are also very versatile and are generally considered to be all-purpose. Yet, these are not as durable as tarps made of vinyl or canvas and excessively cold temperatures can make them brittle. Mesh tarps are less a type of fabric and more a style of tarp. Don't let that stop you from considering these tarps. They have their own purposes and considerations. Most mesh tarps are light-weight, but sometimes you will find some that are rated as heavy-duty. Often used for mesh fences or other privacy issues, these tarps allow airflow while still breaking strong winds. Material and style combined can impact the usefulness of your tarp immensely. However, there are other things to consider. Many different tarps offer different features depending on the features they have innately. Of course, the conditions your tarp will face impact your needs to make sure every wish is granted. Treatments help improve the functionality of your tarp. There are three primary treatments that your tarp may receive to maintain it against the elements. Waterproofing, usually only applied to tarps that are not naturally waterproof, help the tarp resist water damage. Or you may also desire a fire-retardant tarp, which means that it will have increased resistance to flames but will not be fireproof. The third treatment is UV-protection. This sort of protection is popular when a tarp is being used for shade or other outdoor purposes so it can last longer. Another essential thing to consider is the size of your tarp. When you are looking at the size you desire, you might see a note about the size. This is because the advertised size of a tarp is the cut size. What that means is that the manufacturer cuts the tarp that size. Due to hemming and other modifications to the tarp to prepare it for use, the size tarp you receive is generally four to six inches shorter than the cut size. Many find this to be an issue that was not considered before purchasing their tarp. One part of the tarp selecting process that some consider important while others do not is color. Gone are the days of just having a simple blue tarp for every purpose. Now, you can find a tarp in a variety of colors and even some patterns! There's a rainbow of choices for you. Some also have two colors, though that can indicate special treatment, such as additional UV protection. The last consideration for selecting the right tarp would be the grommets. Grommets are the small metal eyelets that are spaced along the side or sides of the tarp as a means to tie them down. These circles may seem like just a visual improvement to the tarp, but they also prevent tearing and abrasion. For each tarp, the grommets might be a different width apart. Each tarp available should have this information in the product description for you to find the right one for you. As with many items, you should also carefully consider the warranty information on your tarp. The warranty will vary from manufacturer to manufacturer. Some will only cover product defects found in the first few days of ownership. This is something to consider before your purchase as well. You might be wondering about the lifespan of a tarp. Unfortunately, there is no hard rule on how long a tarp will last since it has a wide variety of applications. To keep your tarp in the best condition possible, review any care instructions that come with it. Sometimes your tarp needs a helping hand, and that is were accessories come in. There are a few different kinds of accessories available for tarps. Some of the more common ones include bungees, repair kits, and tarp clips. All three of these accessories are functional, increasing how well your tarp can work for you. Bungees and tarp clips are two sides of the same coin, as it were. Both help you secure the tarp to avoid it blowing away or not protecting your property correctly. Many manufacturers will recommend the use of bungees or tarp clips, instead of rope or other products, to avoid damage or loss of your tarp to wind. Repair kits will assist when you have tears or other damage to your tarp. Many use these accessories to increase the longevity of the use of their tarp. They provide a crucial way to increase the lifespan of your tarp. Don't skip out on accessories to improve the performance of your tarp and keep it as functional as possible! Find The Right Tarp Today! With many different materials and types of tarps available, it may seem complicated at first to find the right tarp for you. 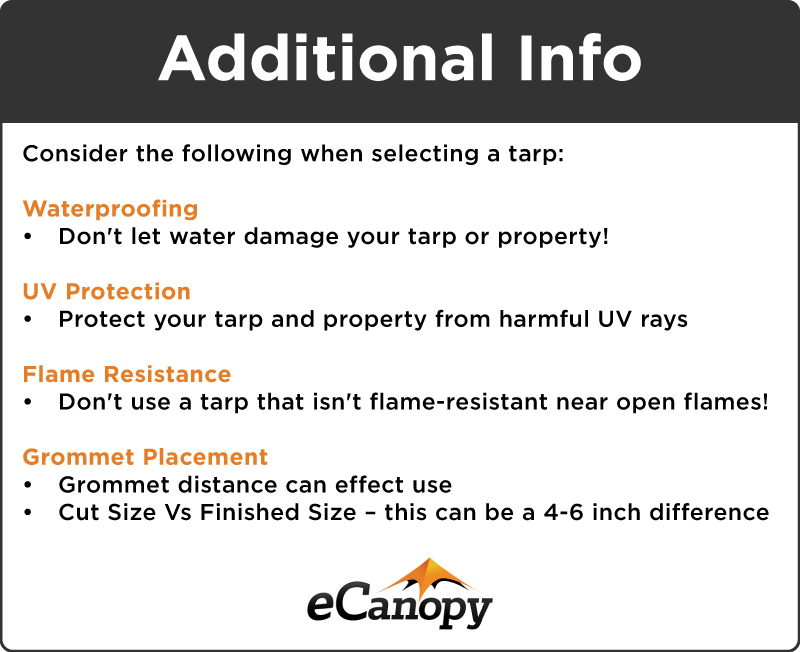 But with this guide and the helpful product specialists from eCanopy, you can find the right type of tarp for you today!